A socioeconomic survey of nursery and greenhouse automation and mechanization was conducted as part of a research program undertaken by the Mississippi Agricultural and Forestry Experiment Station and the U.S. Department of Labor entitled “Enhancing Labor Performance of the Green Industry in the Gulf South.” The 10-page socioeconomic survey consists of eight parts, namely: workers’ demographic characteristics, nursery characteristics, nursery mechanization, greenhouse automation, labor and capital markets, pesticide and chemicals, working conditions, and respondents’ characteristics. The overall goals of the regional socioeconomic survey are to develop a socioeconomic profile of horticulture workers and to evaluate the impact of automation on their employment, earnings, safety, skill-levels, and retention rates. Using a socioeconomic database collected by face-to-face interviews of nurseries and greenhouses, empirical models were estimated to measure the economic impacts of mechanization or automation on annual gross sales, annual employment, and workers earnings, safety and retention. The survey was conducted among 215 randomly selected wholesale nurseries and greenhouses located in eight southern states from Dec. 2003 to Nov. 2009. Posadas, Benedict C. Randal Y. Coker, Christine H. Coker, Scott A. Langlois, and Patricia R. Knight. 2018. 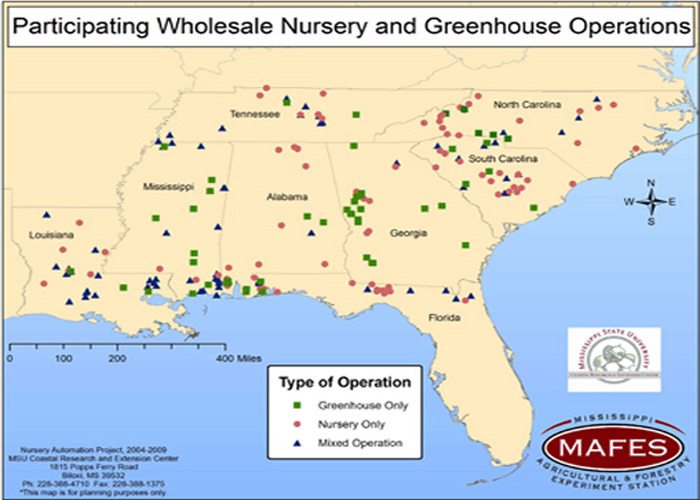 Computer Usage among Nursery and Greenhouse Operations in the Southern United States. Mississippi Agricultural and Forestry Experiment Station Bulletin 1225, Mississippi State, Mississippi. Posadas, Benedict C. 2018. Socioeconomic Determinants of the Level of Mechanization of Nurseries and Greenhouses in the Southern United States. AIMS Agriculture and Food, 3(3): 229-245. Posadas, Benedict C., Patricia R. Knight, Christine H. Coker, Randal Y. Coker, and Scott A. Langlois. 2014. Hiring Preferences Of Nurseries And Greenhouses In Southern United States. HortTechnology, 24(1):101-117. Posadas, Benedict C., Patricia R. Knight, Christine H. Coker, Randal Y. Coker, and Scott A. Langlois. Socioeconomic Impact of Automation on Horticulture Production Firms in the Northern Gulf of Mexico. HortTechnology, 18(4): 697-704.